Heat waves are periods of abnormally hot weather lasting days to weeks. The number of heat waves has been increasing in recent years. This trend has continued in 2011 and 2012, with the number of intense heat waves being almost triple the long-term average. 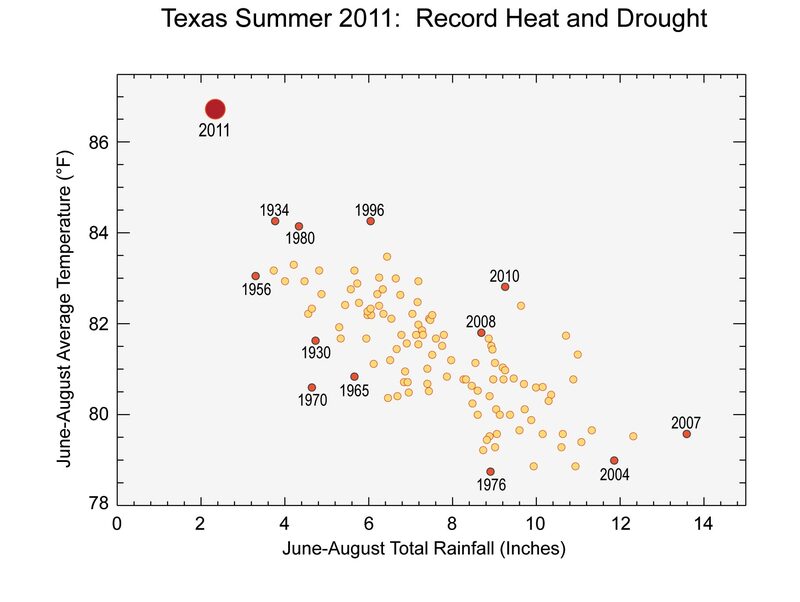 The recent heat waves and droughts in Texas (2011) and the Midwest (2012) set records for highest monthly average temperatures. Analyses show that human-induced climate change has generally increased the probability of heat waves.1,2 And prolonged (multi-month) extreme heat has been unprecedented since the start of reliable instrumental records in 1895. 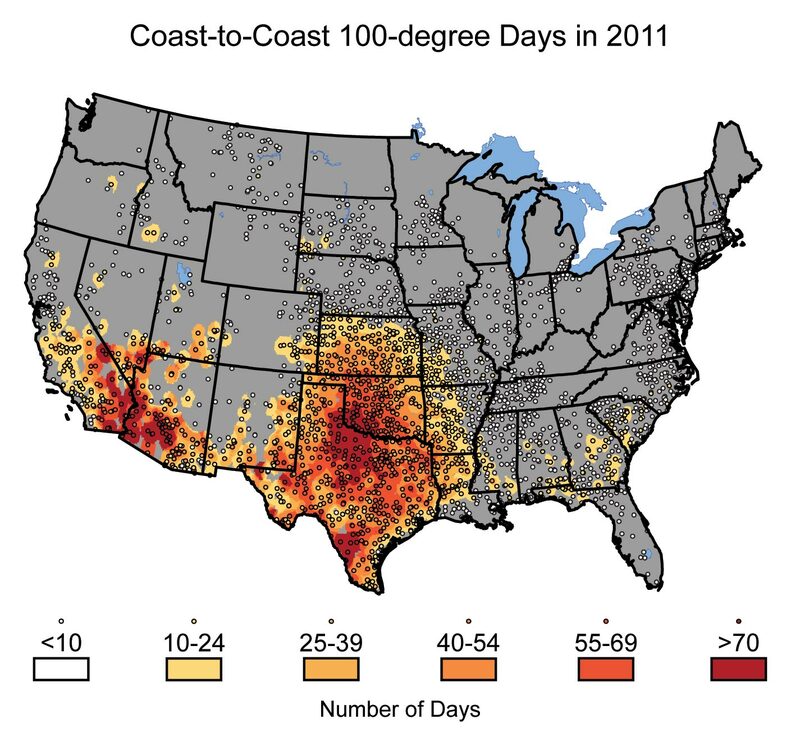 An example of recent drought occurred in 2011, when many locations in Texas and Oklahoma experienced more than 100 days over 100°F. Both states set new records for the hottest summer since record keeping began in 1895. Rates of water loss, due in part to evaporation, were double the long-term average. The heat and drought depleted water resources and contributed to more than $10 billion in direct losses to agriculture alone. 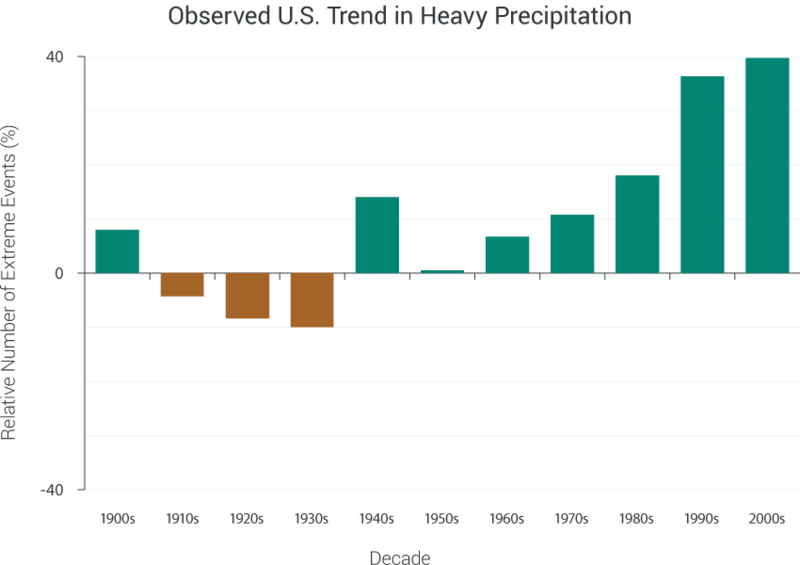 Heavy downpours are increasing nationally, especially over the last three to five decades. The heaviest rainfall events have become heavier and more frequent, and the amount of rain falling on the heaviest rain days has also increased. Since 1991, the amount of rain falling in very heavy precipitation events has been significantly above average. This increase has been greatest in the Northeast, Midwest, and upper Great Plains – more than 30% above the 1901-1960 average. 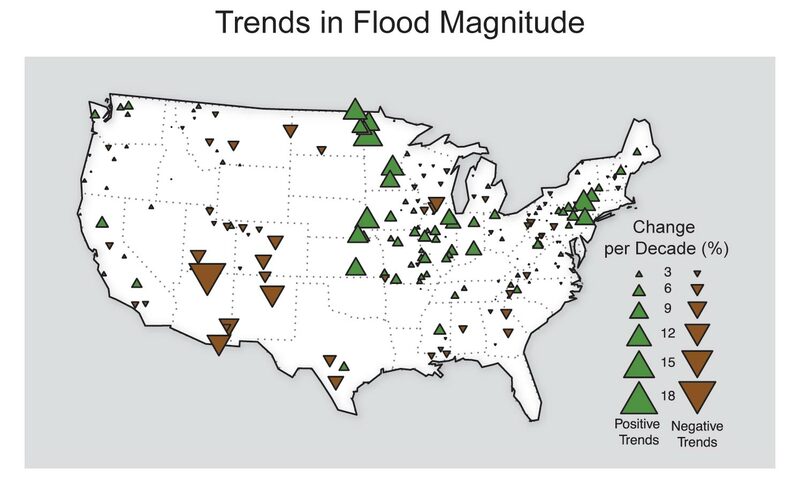 There has also been an increase in flooding events in the Midwest and Northeast, where the largest increases in heavy rain amounts have occurred. One measure of heavy precipitation events is a two-day precipitation total that is exceeded on average only once in a 5-year period, also known as the once-in-five-year event. As this extreme precipitation index for 1901-2012 shows, the occurrence of such events has become much more common in recent decades. Changes are compared to the period 1901-1960, and do not include Alaska or Hawai‘i. (Figure source: adapted from Kunkel et al. 20137). The mechanism driving these changes is well understood. Warmer air can contain more water vapor than cooler air. Global analyses show that the amount of water vapor in the atmosphere has in fact increased due to human-caused warming.8,9,10,11 This extra moisture is available to storm systems, resulting in heavier rainfalls. Climate change also alters characteristics of the atmosphere that affect weather patterns and storms. Flooding may intensify in many U.S. regions, even in areas where total precipitation is projected to decline. A flood is defined as any high flow, overflow, or inundation by water that causes or threatens damage.17 Floods are caused or amplified by both weather- and human-related factors. Major weather factors include heavy or prolonged precipitation, snowmelt, thunderstorms, storm surges from hurricanes, and ice or debris jams. Human factors include structural failures of dams and levees, altered drainage, and land-cover alterations (such as pavement). All flood types are affected by climate-related factors, some more than others. Flash floods occur in small and steep watersheds and waterways and can be caused by short-duration intense precipitation, dam or levee failure, or collapse of debris and ice jams. 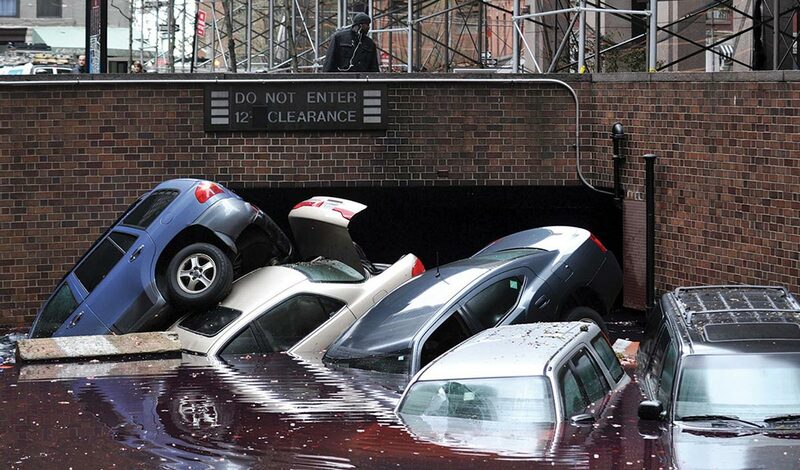 Most flood-related deaths in the U.S. are associated with flash floods. Urban flooding can be caused by short-duration very heavy precipitation. Urbanization creates large areas of impervious surfaces (such as roads, pavement, parking lots, and buildings) that increased immediate runoff, and heavy downpours can exceed the capacity of storm drains and cause urban flooding. Flash floods and urban flooding are directly linked to heavy precipitation and are expected to increase as a result of increases in heavy precipitation events. River flooding occurs when surface water drained from a watershed into a stream or a river exceeds channel capacity, overflows the banks, and inundates adjacent low lying areas. Riverine flooding depends on precipitation as well as many other factors, such as existing soil moisture conditions and snowmelt. Coastal flooding is predominantly caused by storm surges that accompany hurricanes and other storms that push large seawater domes toward the shore. Storm surge can cause deaths, widespread infrastructure damage, and severe beach erosion. Storm-related rainfall can also cause inland flooding and is responsible for more than half of the deaths associated with tropical storms.17 Climate change affects coastal flooding through sea level rise and storm surge, and increases in heavy rainfall during storms. Increasingly, humanity is also adding to weather-related factors, as human-induced warming increases heavy downpours, causes more extensive storm surges due to sea level rise, and leads to more rapid spring snowmelt. 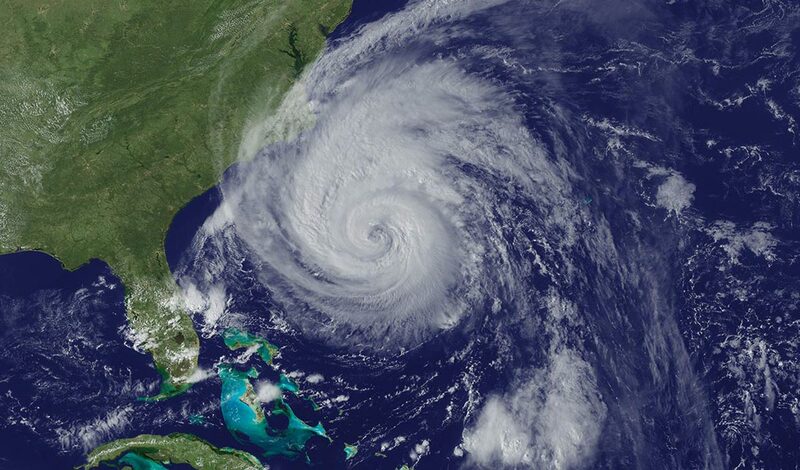 North Atlantic hurricanes have increased in intensity, frequency, and duration since the early 1980s. There has been a substantial increase in most measures of Atlantic hurricane activity since the early 1980s, the period during which high quality satellite data are available.20,21,22 These include measures of intensity, frequency, and duration as well as the number of strongest (Category 4 and 5) storms. The recent increases in activity are linked, in part, to higher sea surface temperatures in the region that Atlantic hurricanes form in and move through. Numerous factors have been shown to influence these local sea surface temperatures, including natural variability, human-induced emissions of heat-trapping gases, and particulate pollution. Quantifying the relative contributions of natural and human-caused factors is an active focus of research. Storm surges reach farther inland as they ride on top of sea levels that are higher due to warming. 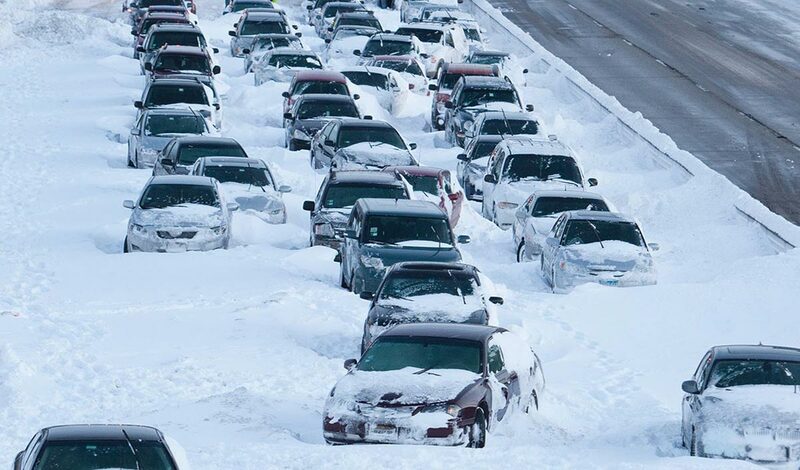 Heavy snowfalls during winter storms affect transportation systems and other infrastructure.